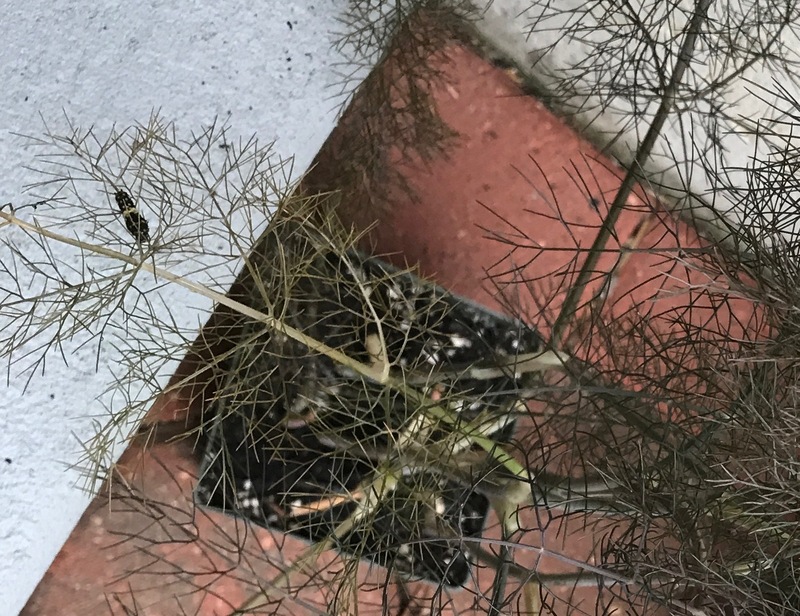 I bought some bronze fennel at my favorite nursery, hoping it would look interesting and dramatic in my garden and that it might attract butterflies. It already has. If you look carefully at the photo, you’ll see a small black caterpillar on one of the stems on the left. Sorry the shot is so crappy but the camera kept focusing on the wall. For decent photos, click here. The caterpillar is about a half an inch long and has a white band around its middle. I wasn’t sure what it was, but I brought the plant home with the caterpillar on it and did some research. It turns out that this is the first instar, or stage, of a swallowtail butterfly caterpillar. (There are several instars before the caterpillar pupates.) I believe it’s a black swallowtail, because they like to lay their eggs on these plants. I haven’t planted the fennel yet, but I will be very careful when I do. I’m hoping to watch this metamorphosis.